For the Slicer, a computer or datapad is just a puzzle to solve with prizes for doing so. With practically the entire galaxy wired to computerized systems, Slicers are extremely valuable people to know, and dangerous to cross. 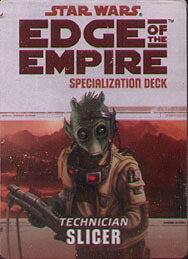 This deck requires the Edge of the Empire Core Rulebook and includes cards for all 20 talents available in the Slicer specialization.